Have you ever thought about becoming the next Martin Scorsese, Clint Eastwood or Steven Spielberg directing the drama of your family's life only to think that bringing those special moments to life looked WAY too hard? If you have a Windows PC then chances are that you already have a clever little piece of software that can do all the hard work for you. I'm talking about Windows (Live) Movie Maker, which is free software included in Windows Me, 2000, Vista, XP and Windows 7. Now let's go and make a movie together! Use the Add Videos and Photos icon to add either still photos (for a slideshow) or video or both from your computer files. Once you have the photos/video clips on the storyboard, you can click on individual or groups of photos/video (CTRL+CLICK) and drag them around the board to move the order. For the rest of the tutorial, I've only talked about a still slideshow using photos but the principles for grouping individual video clips together to make a longer movie is exactly the same. If you are doing a photo slideshow, you can adjust the length of time each slide will show on screen by clicking on the Edit tab and then changing the number of seconds showing on the screen. If you want the same duration to apply to all photos, then make sure you select all photos first by using (SHIFT+CLICK). 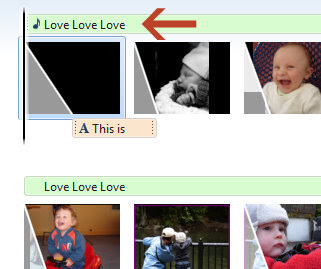 If you want to add a music file to the slideshow from your own music library on your computer, then go back to the Home tab, and select the Add music icon. A browser will then open to your computer files, so find the music file you want to add and click OK. Any MP3 or MP4 file formats should be fine to use (standard iTunes file formats). This will automatically place the music on your storyboard above your photos like this. For this particular slideshow which was 10 minutes long, I added 3 songs placed one after the other to fit the length of the photos I wanted to display. Alternatively before creating a slideshow, I sometimes have in mind what music I want to use already, and so I make sure that the number of photos I use in total is approximately right when combined with the duration of each slide (as mentioned in Point 3) so that the music will end at the same time as the photos. You can edit the music by clicking on the Music Tools tab and selecting various options for Fade In/Out and you can also set exactly when you want the music to start and finish etc, although you do have to be careful if bringing the end point forward that you don't cut off the end of your song! Now it's time to create some transition animations for your slideshow photos. Go to the Animations tab and roll over the various options at the top to see the effect they will have. There are many to choose from, but I often use the Crossfade animation transition as it is quite a soft fade into the next screen. You can also change the duration of the transition. You can make these changes for one by clicking on it, some by holding down CTRL+CLICK or all slides at once by selecting all with SHIFT+CLICK. You can tell when the transitions have been applied to each photo or frame because of the little grey triangle on the left of each photo. Next, let's make an introduction and ending for your slideshow. Click back on the Home tab, and then on one of the Auto Movie theme options. My favourite is the one highlighted in orange called Fade. It automatically adds 1 frame at the start for a Title, and 3 at the end. You can delete any or all of these frames if you don't want to use them all. To edit the text of these frames to your own words, just click into the text box and the black frame will be editable on the left hand side of the screen. You can change the look and feel of the text as you would in any other Microsoft Office product. There are also text transitions at the top right you can use as well. Once you are reasonably happy with the photos, music, animation transitions, and intro/ending, play the movie through to see how it looks all in its entirety by clicking on the Play button under the large screen. Make any further edits as necessary. 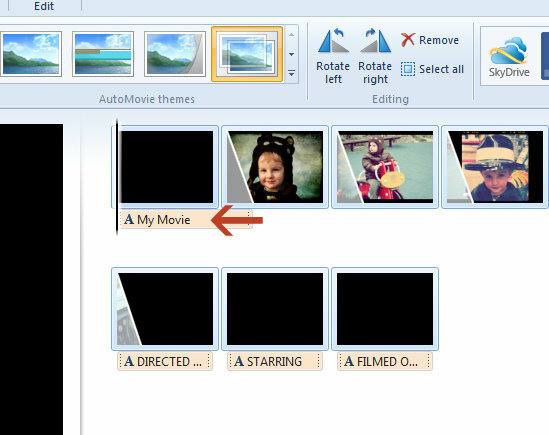 If you want to save the Movie project at any time during the process to edit or complete at a future date, make sure you go to the File, save as, and save it as a Movie Maker project file. 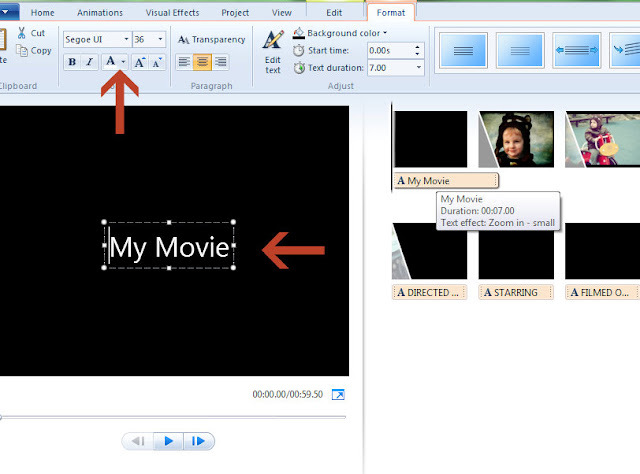 Once you are happy with the finished product, click on the Save Movie button. This will create a finished (non-editable) Windows Media Video file (.wmv) to your computer. The easiest way to play your finished movie on your blog is by uploading to YouTube first. You'll need to have a YouTube account set up to do this. 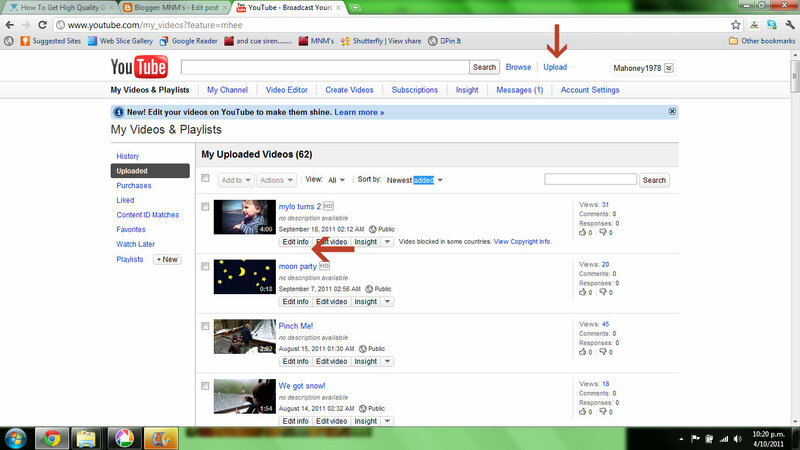 Once you have uploaded your file to YouTube, click on 'My Videos' and click on the Video you have just uploaded. 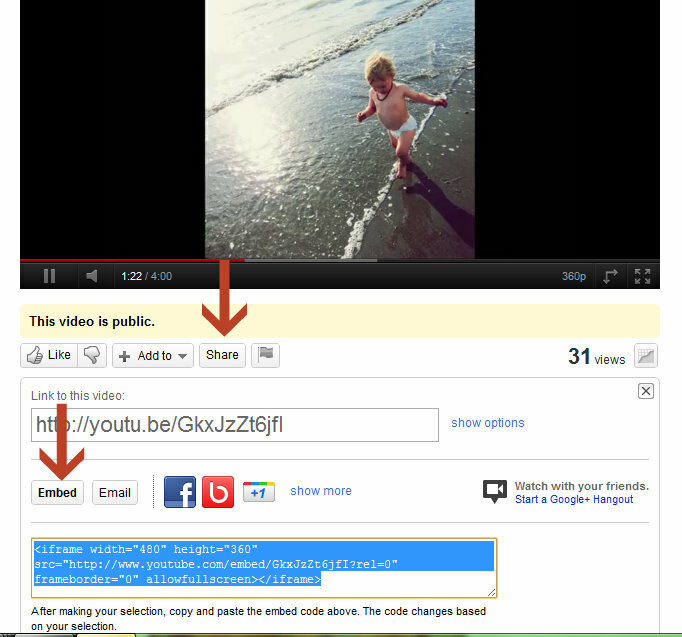 Click on Share, and then Embed. Then copy the text highlighted in blue to your blog. You'll need to make sure you are in the 'HTML' tab rather than the 'Compose' tab of a blog post for this to work. Oh and one more thing, be sure to add the link to your blog post containing your finished movie in the comments so I can enjoy all your hard work and creativity too!